Learn with Play at Home: Cornflour Slime. How to make and what not to do! Cornflour Slime. How to make and what not to do! Cornflour Slime (or Cornstarch Slime) is a favourite activity of teachers and parents around the world. It is very popular as it's incredibly easy to make, doesn't use any nasty chemicals and has amazing properties unlike anything you may have experienced before. It is sure to delight young and old alike! This is a great activity to introduce your kids to the concepts of fluids and solids, because unlike most fluids (which are something that can flow), when applying pressure, this mixture acts like a solid. You can read more about the science behind why it does that, here and here. Add some food colouring to your water. What not to do: Do NOT add a lot of blue food colouring. Your hands will end up stained, like ours. You should use no more than 4-5 drops (my daughter added quite a bit more than this while I was photographing) and perhaps go with a green (most popular) or red. Slowly add your water to your cornflour ensuring not to add more than half the amount of water to cornflour ratio. Give it a stir part way through. This is a fun part of the experimenting. It allows the children to see what is happening at this point and make decisions as to whether more water is required or not. They decided that more liquid was required! Oooh, starting to get there! Check out this solid lump we made! You will know when your slime has all come together. It should be easy to stir slowly and flow like a liquid but try giving it a fast stir and see what happens! Woah! What is big sister doing? I've got to try this as well! Can you catch it? Can you stop it from flowing? If you can not form a ball, try adding a little bit more cornflour (cornstarch) until you can. Try some of the experiments they do with their cornflour slime here. 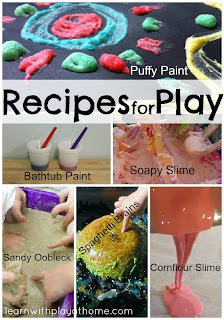 Try adding some little plastic creatures like dinosaurs or insects to your slime to further the play. 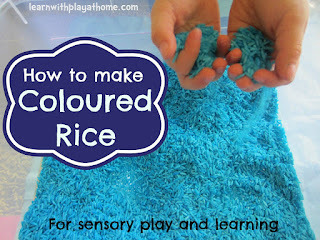 You could add plastic numbers or letters to further enhance the learning from this activity. - If you missed our "What not to do" in the body of the post, it was in relation to using the colour blue and the amount of food colouring you need. We ended up with blue stained hands so if you want to avoid that, try using another colour or using no more than 4-5 drops of food colour. If you do happen to stain your hands, bicarb of soda should help you get the colour out of your skin. - Keep a bit of cornflour (cornstarch) on the side so that if your over enthusiastic children tip in too much water, you will always have some extra cornflour to make the mix right. Our slime ended up with a little bit more water than I would have liked but we just had to go with it as little N had already tipped in all of our remaining cornflour. Next time I will keep a bit extra on the side just in case. - You can keep your cornflour slime, covered in the fridge for a couple of days without it going bad. You may need to add some more water and give it a good stir to reinvigorate it! oh I do love the humble cornflour slime....so many possibilities isn't there? Love all those glorious photos Deb...such messy fun! I LOVE that first picture. Classic! This looks like so much fun. I would love for you to come link it up at Artsy Play Wednesday. Oh haven't done this in a while! I love how incredibly messy your kids got with this! Oh I love slime! I haven't done it with my little one yet but N always inspires me to get her more creative. Thanks for the handy hints. This is so easy, quick and so much fun! We have made this once but once is not enough, we'll have to make it again soon ;-) Cornflour has such a smooth and silky texture too. Oh this looks so much fun! I love the bright blue colour. You can tell the kids are having a blast! Thanks for linking to The Sunday Showcase. I've pinned to our boards. Never made this... I think blue would give me a little too much worry! haha! I saw your post on facebook and went O.O !! Wow! What gooey fun! I will trying this in Summer when we can do it in the yard! Isn't this the best? We make this at home a lot because of all the "slime" recipes it's the best for Mr 5's sensitive skin. Love it. Awesome, your photos made me want to make some slime right now, the kids look like they are having a ball! LOVE cornflour slime! (Also love the little chefs hat!!) We are featuring your post this week on Share It Saturday. Thanks for linking up! Thank you for letting me feature this Debs! I tried this with my kids this week and it is SUCH fun stuff to play with. We used a squirt of water colour paint instead of food colouring and while we did get green hands, it washed off really easily with soap and water - and wiped off the bench and floor easily too. What a fantastic idea! ...Thanks for the easy guide. What a wonderful guide!- Thanks for posting it here!